On August 26, 2018, State Councilor and Foreign Minister Wang Yi held talks in Beijing with Foreign Minister Saleumxay Kommasith of Laos. Wang Yi expressed that China-Laos relations have set the goal of building a community of shared future with strategic significance. 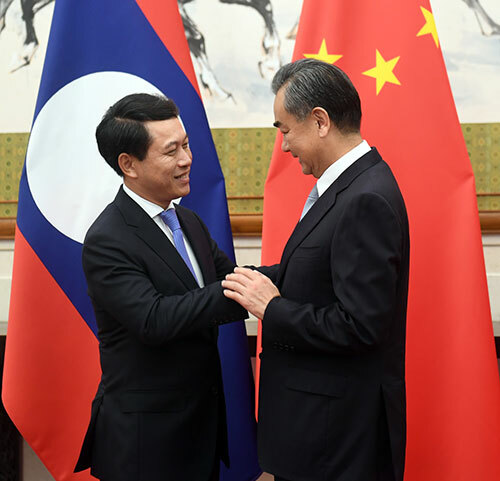 Under the personal guidance and promotion of the top leaders of both sides, China-Laos relations have maintained a sound development momentum, taken on a series of new looks, and formed a new pattern of the joint construction of the Belt and Road Initiative supported by the planning of China-Laos economic corridor, driven by cooperation in major projects, and assisted by cooperation in peoples' livelihood and poverty alleviation, thus injecting new connotation into the comprehensive strategic cooperative partners between China and Laos. The Lancang-Mekong cooperation (LMC), the new type of sub-regional cooperation, has also achieved positive progress with the joint efforts of China, Laos and other countries, and created new highlights of China-Laos multilateral cooperation. The Chinese side speaks highly of such progress. Wang Yi stressed that the Chinese side will continue to firmly uphold its friendly policy towards Laos, and accelerate the implementation of the consensus reached by the top leaders of the two parties and the two countries, maintain high-level exchanges, enhance strategic communication, and conduct in-depth exchanges on state governance and administration with the Lao side. Both sides should speed up the planning of China-Laos economic corridor, expedite the construction of China-Laos railway, and make efforts to put more cooperation projects in place. Both sides should further activate China-Laos people-to-people and cultural exchanges and strive to maintain the strong momentum of the LMC, so as to better benefit people in the region. Saleumxay Kommasith noted that the Lao side sincerely thanks the Chinese side for its immediate sympathies and assistance after the dam collapse in the southern region of Laos in July this year. Such gestures are vivid demonstration of the profound friendship and high-level comprehensive strategic cooperative partnership between the two countries. The regular and frequent meetings between the leaders of the two parties and the two countries have provided important strategic guidance for the development of bilateral relations. He completely agreed with Wang Yi's positive comment on Laos-China relations. The Lao side is willing to, together with the Chinese side, actively implement the important consensus reached by the leaders of the two parties and the two countries, intensify high-level exchanges, accelerate the joint construction of the Belt and Road Initiative, steadily advance the construction of the Laos-China economic corridor and the Laos-China railway, deepen people-people and cultural exchanges, and take the opportunity of the Lao side assuming as the co-chair of the LMC to deepen LMC cooperation, in a bid to promote Laos-China comprehensive strategic cooperative partnership for constant and new progress. Both sides also had strategic communication on international and regional issues of common concern.